The gite 'Ciel' was renovated during 2017, many new items have been added including dishwasher, cooker, woodburner and multiple items of furniture including double bed and new linen throughout. It is a one bedroom property which, taking advantage of the new, comfortable sofa bed downstairs gives plenty of space for up to 4 people, each couple can also have their own shower room. Ciel has its own private space and raised decking giving uninterrupted views over open countryside, there is nothing better on an evening than sitting with a glass of wine and taking in the moment. To book follow this link, please Contact Us for the latest deals. An open plan, newly installed kitchen gives a clean and bright area in which to prepare meals. 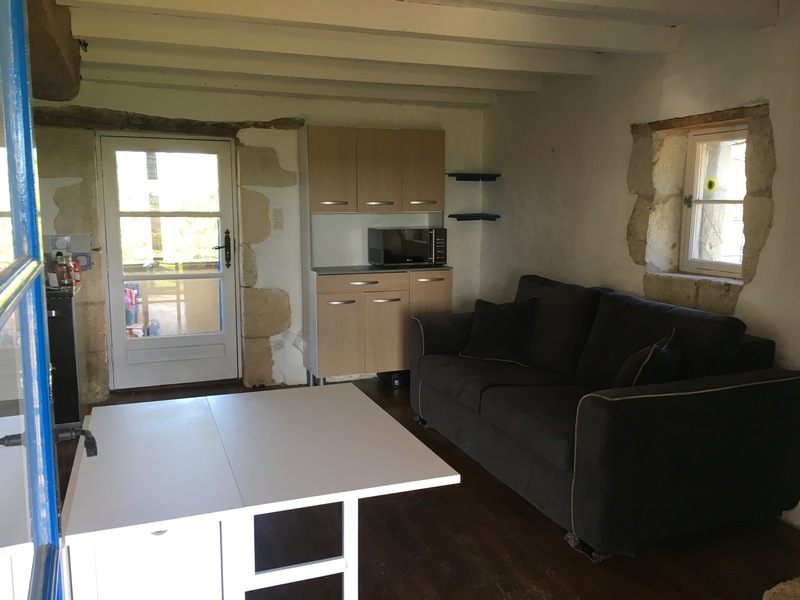 The kitchen has a new fridge, cooker, microwave, kettle and dishwasher, it also has all the cookery, cutlery, pans etc required. A dining table can be extended to fit up to 4 people if required. 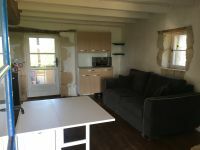 The living area is again open plan with functional oak beams running along the ceiling. The corner of the living area has a wood burning stove for the winter nights and also a door out onto the private patio below the scenic seating area. 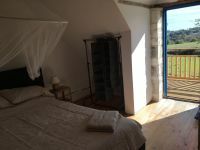 The large upstairs bedroom offers ample space and also gives access to the raised viewing platform for relaxing during those long summer evenings with a glass of wine in your hand. 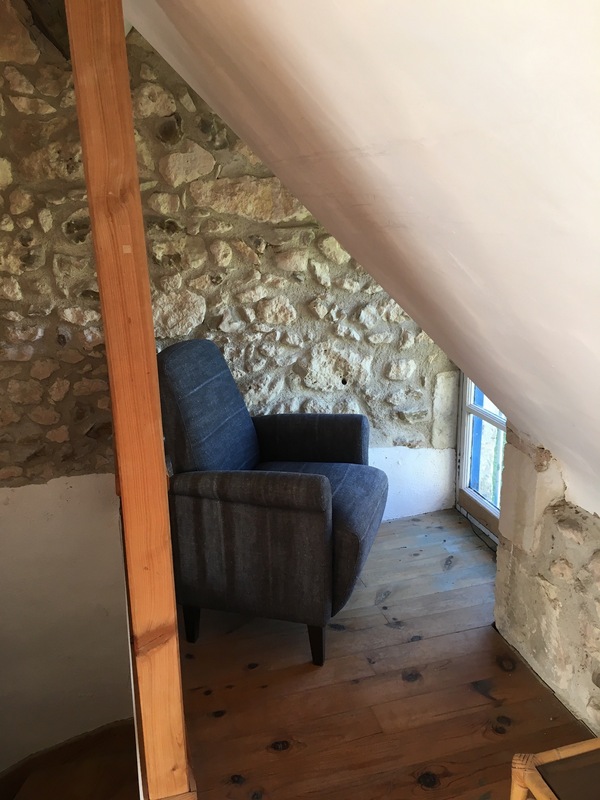 Inside there are oak beams supporting the high roof and a separate reading chair positioned to give one eye on your book and one eye on any comings and goings that may (or may not!) take place. 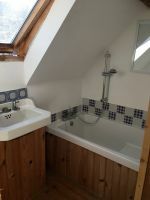 This gite benefits from 2 shower rooms, one upstairs and the other downstairs. The upstairs has a hand shower, sink and toilet and is clean and bright. 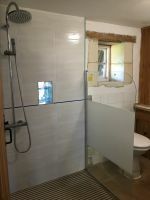 Downstairs is the newly refurbished bathroom giving a large walk-in shower/wet room suitable for wheelchair access, a hinged screen folds back to offer ease of access to the toilet and sink. 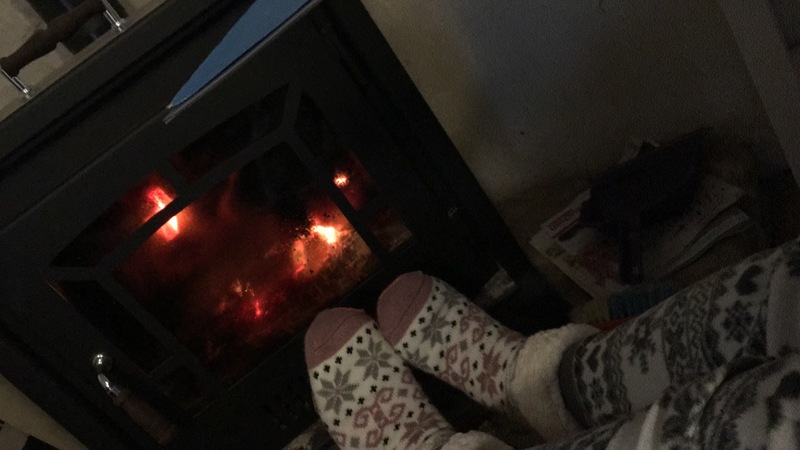 A woodburner provides a functional and romantic ambience although several electric wall heaters are located around the property. Various outdoor activities are available as well as boardgames and a selection of books. 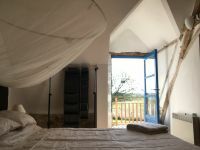 Ciel benefits from its own downstairs private patio and upstairs decking areas along with a small garden area separated from the main grounds by hedges. Visitors are welcome to take a stroll to the edge of the land and find a peaceful area in which to relax or play ball games. We have 3500 square metres and numerous trees under which to seek shade. Suitable for people looking for a great base from which to explore. The comfortable sofabed downstairs and easy access shower room make this gite accessible to those with reduced mobility, please contact us for more information on this. 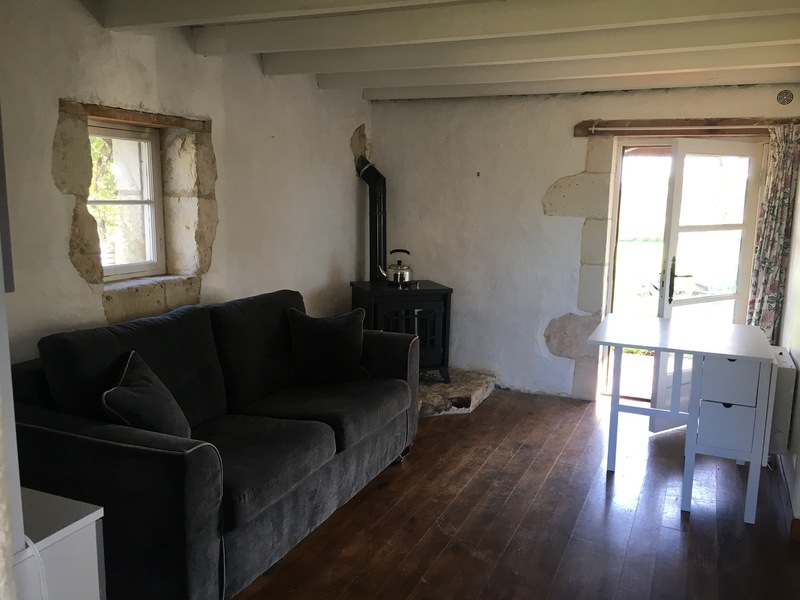 For larger groups we have other properties in the same location, each has its own individual area but all can be rented as one - discounts are available for multi gite bookings.